Huge congratulations to LT Jesse Iwuji on his first NASCAR national series start! Seeing as our beginning was sparked by a fellow Naval Academy Alum, we at Zulu Audio are proud to sponsor LT Iwuji. From day one, LT Iwuji has been an inspiration to NASCAR fans and beyond. He has come onto the scene with little experience and money with a huge drive to achieve his dreams. His rise to where he is today is even more impressive as he continues to serve in the Navy while pursuing his career as NASCAR driver. At Sundays’ event (2:30 PM EST, 8/26/18), LT Iwuji plans to race the No. 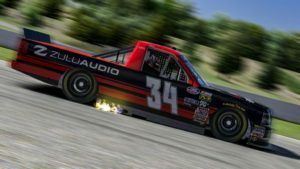 34 Reaume Borthers Racing Truck, currently painted in red and black. Ari Polivy, an active duty U.S. Marine and inventor of the Zulu wearable speakers, has been a long time friend of LT Iwuji. We are truly honored to be one of Jesse’s sponsors and have him be a part of the Zulu Audio team. We admire LT Iwuji for his perseverance and determination and wish him the best this weekend!